A few boats headed out today to catch King Mackerel commercially, they had a pretty good day. They were trolling with both live and dead baits. So if King Mackerel is for you, now would be a good time to come and fish. If you have questions about a trip you have booked or would like to book next year give us a call at 1-800-676-4939. Another day of cold wind but it's that time of year. Some great gifts in the store 40% off. Come grab that perfect thing for someone on your Christmas list. We will be open the rest of the week 6AM-5PM and will be closed starting Sunday Dec 23rd and reopen Jan 2nd. We are experiencing tremendous rainfall amounts and are under a flash flood advisory today. Duck hunters went out and had a great day with Pintail, Red Head, Bufflehead, Brant, and Scoter - something to be said about "It's good weather for ducks". They returned early because of heavy rains and low visibility. Big seas kept offshore boats at the dock. We had overcast skies along with much warmer temperatures today. No boats fished, but we had some hunting guides getting set up to take hunters out into Pamlico Sound for waterfowl charters. We are forecast to receive heavy rainfall from this evening into the day tomorrow. Be safe and keep dry! We finally had a few boats to fish offshore after 5 days of big seas and high winds. Most were commercial fishing and the King Mackerel bite was on! 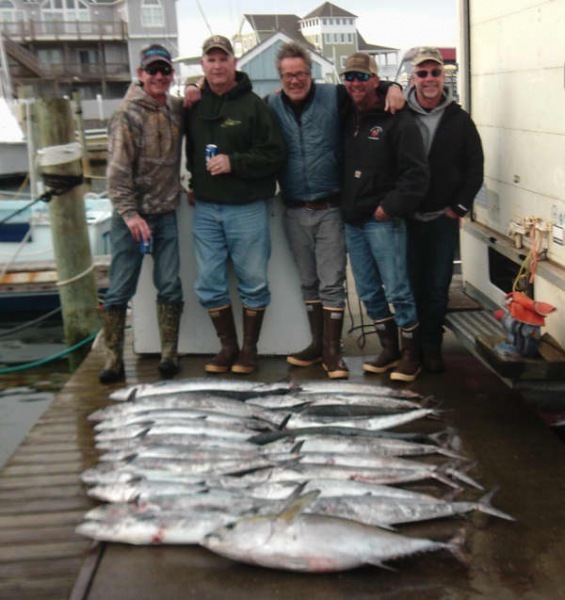 One charter went after Tuna but did not prevail. Hopefully the weather will let up so they can continue, although more rain is forecast for the weekend. We had two charters go out today and they experienced a good King Mackerel bite and one Wahoo was caught. It is cold and raw here but we did get our annual Christmas Parade in without any rain. A coastal storm is upon us and we can look for high wind from the NE with rain and possibly snow the rest of the weekend. Stay safe! Several boats went out commercial fishing for King Mackerel today. One charter fished and they returned with a Blackfin Tuna and some King Mackerel. 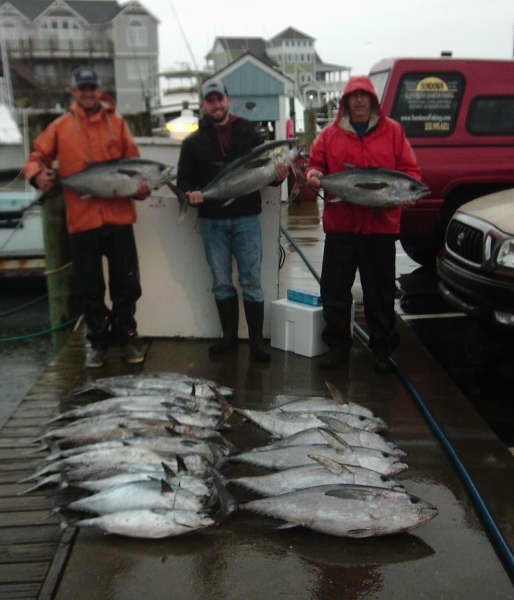 A coastal storm is forecast for later this weekend and will probably affect fishing conditions. Keep in touch! Charles Goss III of Chalfont, PA: 32 lb. Blackfin Tuna on Release. We had a handful of boats head out to the Gulf Stream today. The weather was fairly mild, although overcast with rain showers later in the afternoon. 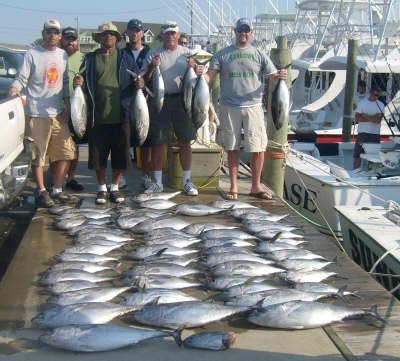 They experienced a good Blackfin Tuna bite and they went live baiting for King Mackerel. Some nice big fish were thrown on the dock! A Wahoo was reported by a private boat. December is here and it's only 24 days until Christmas - we have lots of gift ideas in our Ship's Store - stop by and find something for that special someone! Miltos Stefanitsis of Henrico, VA: 29 lb. Blackfin Tuna on Good Times. 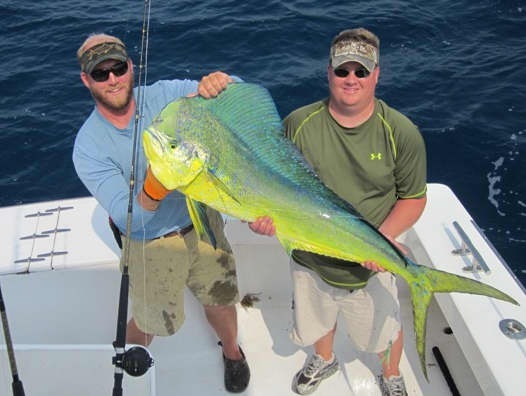 John Richards of Port St Lucie, FL: 25 lb. Blackfin Tuna on Good Times. Stephan Thomas of Chester, VA: 30 lb. Blackfin Tuna on Good Times. Ashley Johnson of Chesapeake, VA: 25 lb. Blackfin Tuna on Good Times. Jonathan O. Sprowl of Fuquay Varina, NC: 30 lb., 36 lb. and 39 lb. Blackfin Tuna on Release. Andrew Newsome of Apex, NC: 31 lb., 34 lb., and 37 lb. Blackfin Tuna on Release. Jonathan Sprowl of Fuquay Varina, NC: 33lb., 37 lb., and 40 lb. Blackfin Tuna on Release. It's hard to believe that December begins tomorrow. 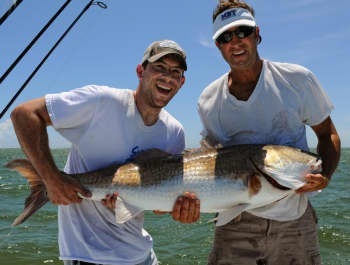 Inshore Captains have been busy with maintenance as the Drum and Speckled Trout have moved out into the surf. Several of our Captains run Duck Hunting Guide Services during the colder weather when in season. Several offshore boats headed out to commercial fish and one took a charter. 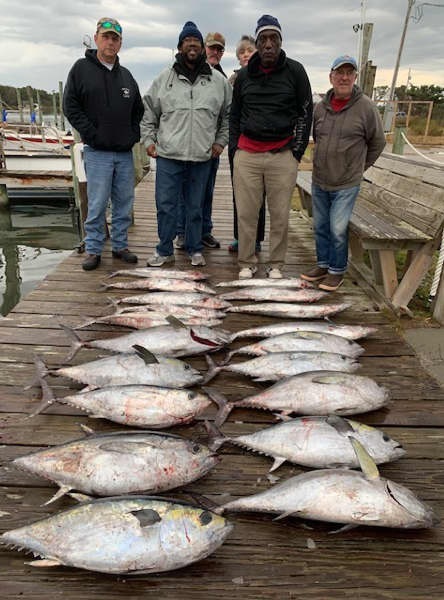 They had a good King Mackerel bite and one Tuna was reported - hopefully the Tuna bite will pick up! We did have a few boats out commercial fishing for King Mackerel today. We had abundant sunshine along with some of the coldest temperatures yet - at least the wind stopped blowing! 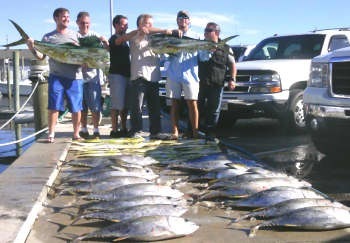 Tomorrow the wind will turn SW and bring some warmer weather so maybe some charters can get out and go for some Tuna!